My name is Commander Joel Stewart and I’m a proud member of the United States Navy. I’m also a native Montanan who grew up in Great Falls Montana. I’ve hunted and fished around our great state as a kid, and get home whenever I can. In January of 2005 I was sent to Iraq to serve in Baghdad as part of Operation Iraqi Freedom. I was assigned to a coalition staff, serving under a 3-star Army general. It was an unusual assignment for a Sailor, but I was selected and I served with pride. It was a very rewarding tour in a number of ways both professionally and personally. Today, I am writing about the latter, as it is by far the most unique. I think being a Montanan gave me a extraordinary sense of self-sufficiency and preparedness. What I thought was common sense when I grew up proved to be the exception once I left Montana and entered the service. It was that sense of preparedness and self-sufficiency that caused me to toss an old fishing rod in my sea bag as I packed up to leave my family and go to war. 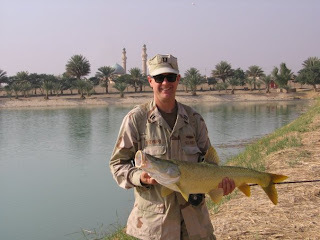 I did not plan to fish in Iraq, I didn’t know they even had places to fish, as that was not a focus of my studies as I prepared for my deployment. I thought I might have a chance to fish in Georgia as I went through training and that is why I tossed the rod in. Ultimately, it proved to be a very good idea. 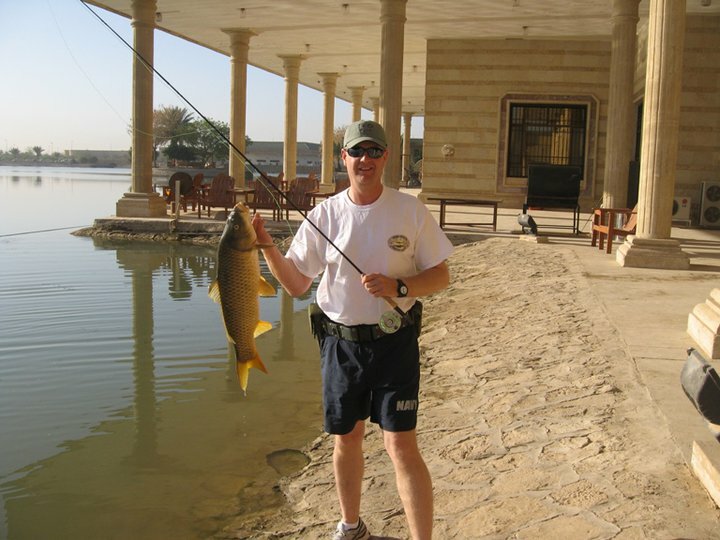 When I did get to Baghdad, I discovered that Saddam Hussein has built a number of lakes, at the expense of the people in his country, and stocked the lakes with both native and non-native fish. In my down time, I soon discovered the fish took flies. I had found an outlet for my stress that I did not expect. Any spare time I had I tried to spend on the water, either fishing or learning about the new species of fish I was encountering. I talked to a lot of people, most of whom had not brought fishing gear. Most had not seen a fly fisherman either. That gave me an idea. Life in a war zone is not easy. It’s not fun, and it’s not glamorous. The people who volunteered to go liberate Iraq lived under incredible circumstances, and distractions from the daily shellings and firefights were desperately needed. Sharing my passion with others and perhaps give them a way to get their mind off their duties was as much a tonic for me as I hoped it would be for them. 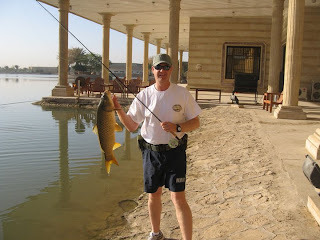 I tapped into the power of the internet by reaching out to fly fishing forums across the world. Through the collective it provides I soon had everything I needed to teach people to fly fish. Rods, reels, flies, leaders, etc poured in as the folks back home learned about this great opportunity to help their sisters, brothers, fathers and wives. I put out flyers and soon had a class full of Soldiers, Sailors, Airmen and Marines learning to fly fish. It was surreal, watching them learning the basics of fly casting with a M-16 slung over their shoulder. The tranquility we all felt with a rod in our hand helped us get through the long hours and separation from our families. The classes ran until my tour ended in February of 2006. Anotehr fly fisherman, Bill Jones (a fellow Montanan to boot) agreed to carry on from where I left off. That started a chain of leadership that went unbroken until US troops pulled out of Iraq in late 2011. 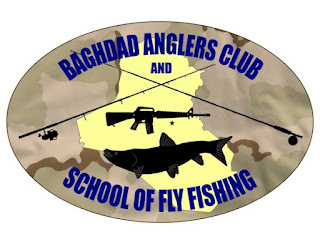 The group I founded morphed from the Baghdad School of Fly Fishing to the Baghdad Angler’sClub and School of Fly Fishing. The mission had adapted from teaching fly fishing to getting the troops out on the water to fish as a form of recreation that gave them either a taste of home or perhaps kindled a new passion. Our actions define who we are. I am a man who loves God, family and country; I am willing to give my life for all three. I have a strong faith and live by the Golden Rule while respecting other’s right to believe as they choose. I cherish my family and live every day to show the world an example of a man who is a faithful husband and loving father. I serve my country, as a Sailor on active duty in the Navy, and have for the past 26 years. These things partly define who I am, but not all of me. The rest is defined by my experiences and the most formative were my years before I joined the Navy at 19, the years I lived in Montana. I will always be a Montanan, though now I have lived more of my life out of Montana than in it, Montana has always been a part of who I am. Montana is in my bones. Part of being a Montanan is an understanding of the natural world and I am defined by the things I do in the outdoors. Fishing, fly fishing in particular, is forefront ahead of hunting, camping, hiking, and boating. I am a fisherman and it is a part of almost everything I do. I am honored to have shared a piece of me, and Montana, with the men and women serving in Iraq. I like to think Theodore Roosevelt would have been proud.